The December WER report examines whether OPEC’s decision to limit crude production could help accelerate deepwater project starts over the next 12 to 24 months, given 3 billion barrels of oil stocks in global inventory and 5000+ drilled-but-uncompleted shale wells in the US ready to be fracked. We also review BPs decision to sanction the Mad Dog 2 deepwater GOM project, assess Hoegh and Maran’s orders for seven speculative FSRUs, discuss Petrobras continuing difficulties getting back to orderly business conditions and profile the energy industry “dream team” about to take cabinet positions in the incoming US administration. 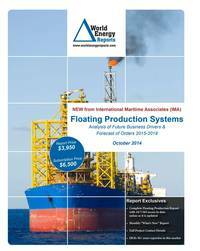 In the data section of the report are details for 200 floater projects in the planning stage, 54 production or storage floaters now on order, 284 floating production units currently in service and 29 production floaters available for redeployment contracts. Charts in the report update the location where floating production and storage systems are being planned, operating, being built and to be installed. Accompanying excel spreadsheets provide the report data in sortable format. Information is current as of 20 December.